The most exclusive and enjoyable daytime parties in an elegant hotel with a unique personality. 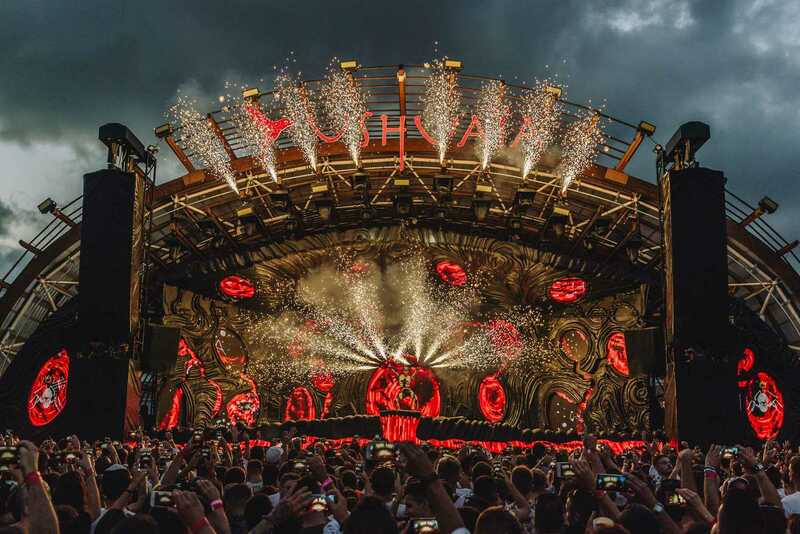 This is what’s on offer at Ushuaïa Ibiza Beach Hotel: a combination of the best music and entertainment for adults, with performances by world renowned DJs, cutting edge design, the latest technology, VIP services and a fascinating variety of gastronomy in its 5 restaurants. 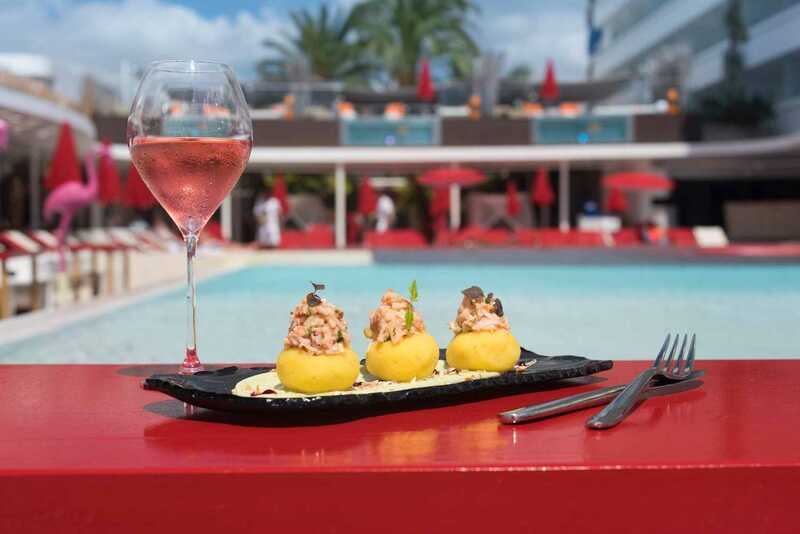 Ushuaïa Ibiza Beach Hotel consists of two adjacent accommodations: The Ushuaïa Club, which includes an incredible swimming pool next to the stage where events are held, and The Ushuaïa Tower, for people wanting to live the Ushuaïa Ibiza experience in a more discreet atmosphere. 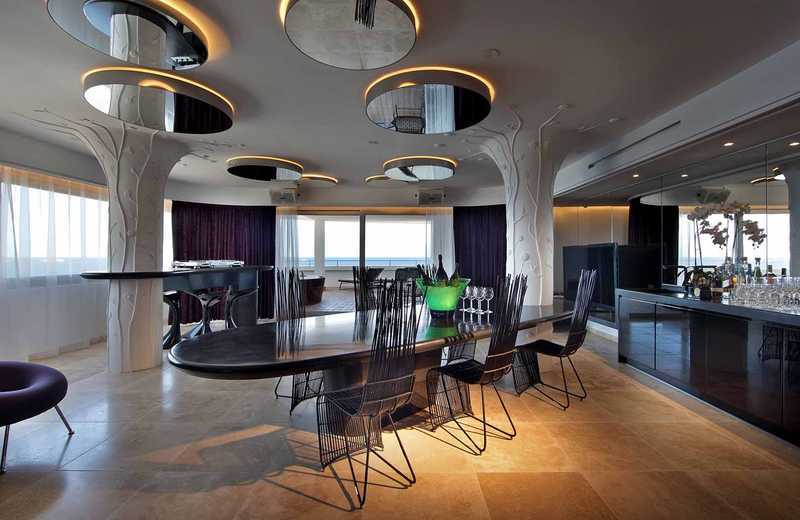 Its eight stories have 181 Double Superior rooms with terraces, the best luxury suites on the island of Ibiza with exceptional views of the stage and sea. Blackout curtains, maxi-bar, aromatherapy menu, sensual shower and of course, free WiFi are some of the amenities included in all stays. So everything is at your fingertips night and day...within the fabulous timeless zone Ushuaïa Ibiza creates. We don’t like to come up short. That’s why we offer ten categories of luxurious rooms and suites, all with complimentary admission to events. Which to choose for a non-stop party? The Pioneer DJ Suite, which comes with a complete music system, including mixer, amp and subwoofer. Go ahead, blast the music...it’s soundproof! 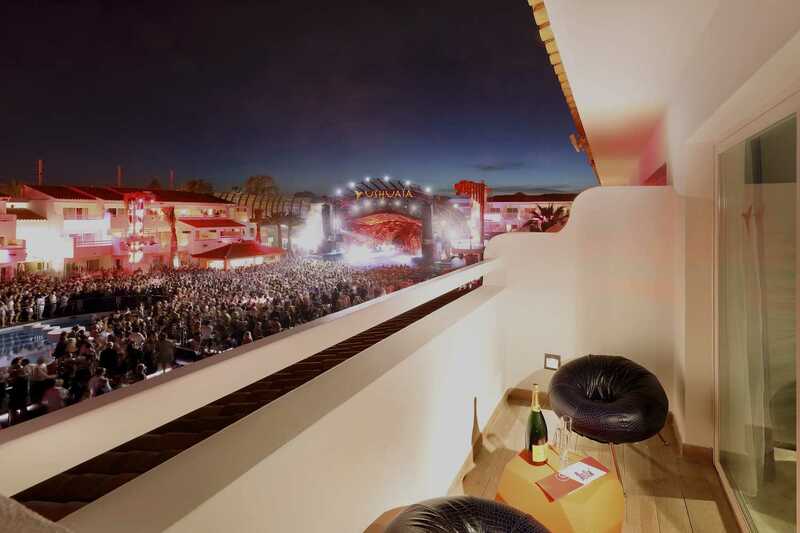 The heart of Ushuaïa Ibiza Beach Hotel. Its leitmotiv. Everything orbits around this spectacular stage where every season the best DJs of the international scene play. The energy flows, bodies become warm, the sexiest go go dancers gyrate on podiums and all guests vibrate with the best scene on the island. Ushuaïa Ibiza in its pure state. There are guests who become vampires in the night and don’t even notice them. A shame, because the two pools of The Ushuaïa Club are the best place to meet good-looking people in a relaxed manner. To enjoy the exclusive river pool, you must reserve Double Superior Swim-up Rooms. 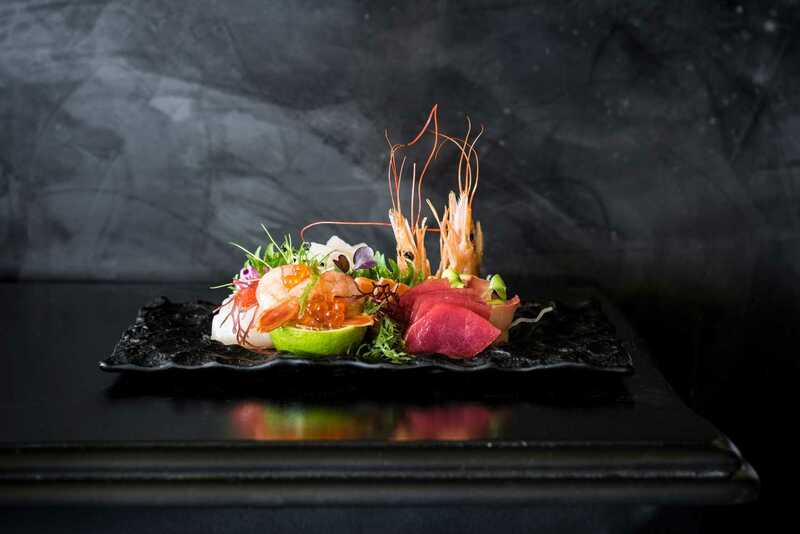 Japanese restaurant specialising in sushi and other Asian dishes prepared on private Teppanyaki tables where the chef gives a virtuoso live cooking performance. With a minimalist design, it has a Zen garden, an interior pond and a terrace next to the stage called “Minami Lounge” where you can enjoy the best DJs in the world while you dine. Especially conceived for meat lovers. 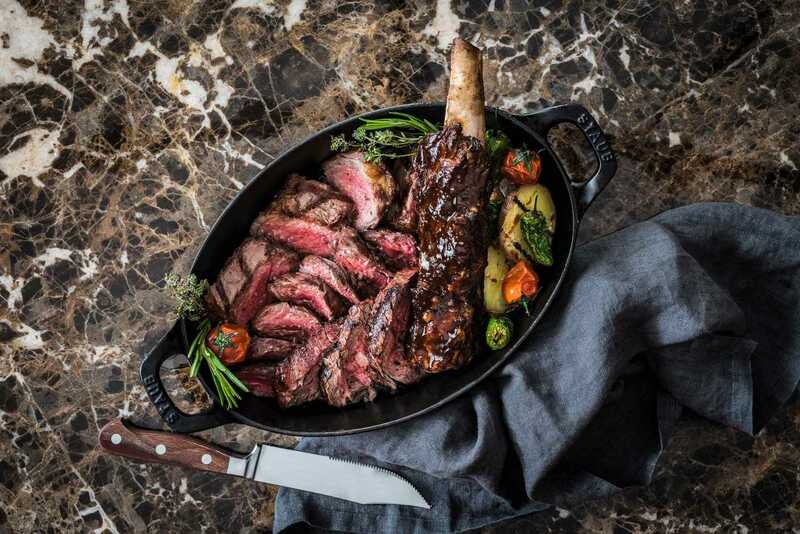 Offering a premium quality variety of beef, as well as fi sh and shellfi sh, exquisite side servings and an exclusive range of wines and champagnes from the extensive and carefully selected cellar. 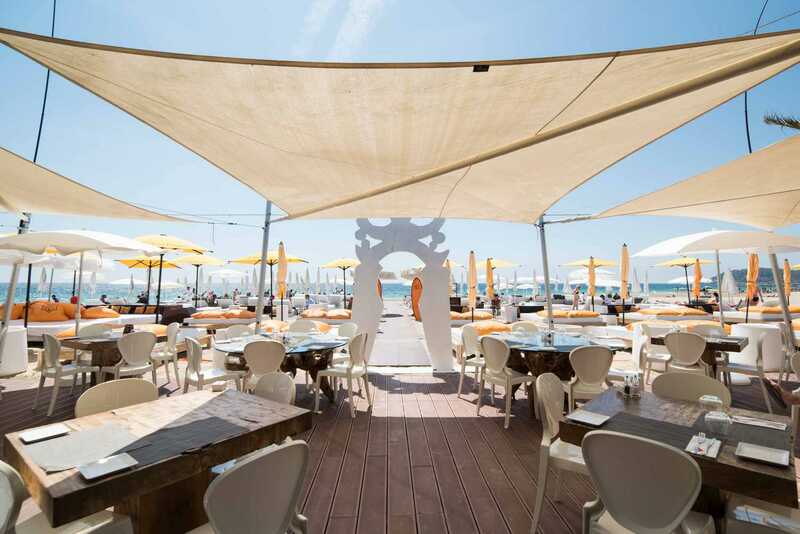 Beach side restaurant combining a unique selection of Mediterranean and Asian flavours. Its natural, sophisticated décor makes it the best place for enjoying the atmosphere and it also has Balinese beds for guests who prefer being close to the sea. 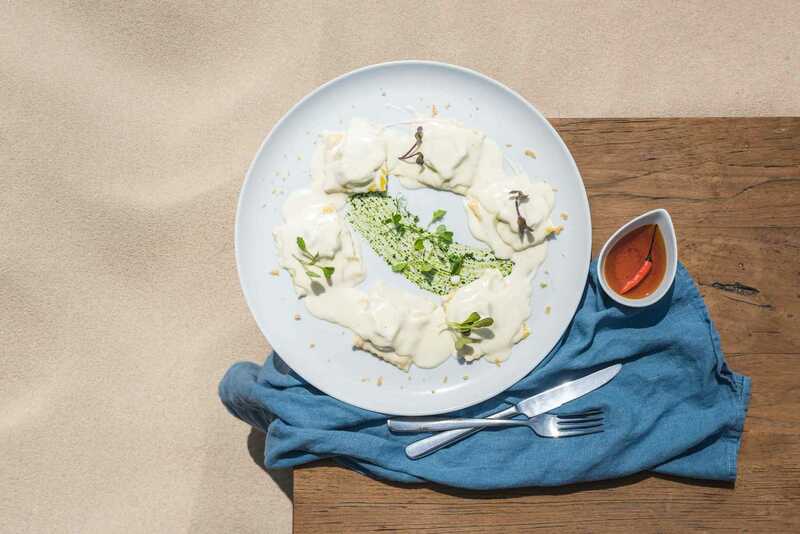 Beach side restaurant specialising in Italian and Mediterranean cuisine. Artisan fresh pasta prepared in copper moulds, pizzas, shellfish and fish, home-made limoncello and traditional desserts, plus many other in-house specialities. Oysters and caviar, two of the world’s most exquisite delicacies, play a leading role in this restaurant, in addition to a careful selection of shellfish and Nikkei cuisine. Meals are served around the pool and opposite spectacular views over the Mediterranean.